STaSIS Replacements : Stasis 390mm x 32mm Discs (Pair) by Phenom. Rotors pictured are a sample image that represents the style of rotor. The 390mm version has 12-mounting holes. 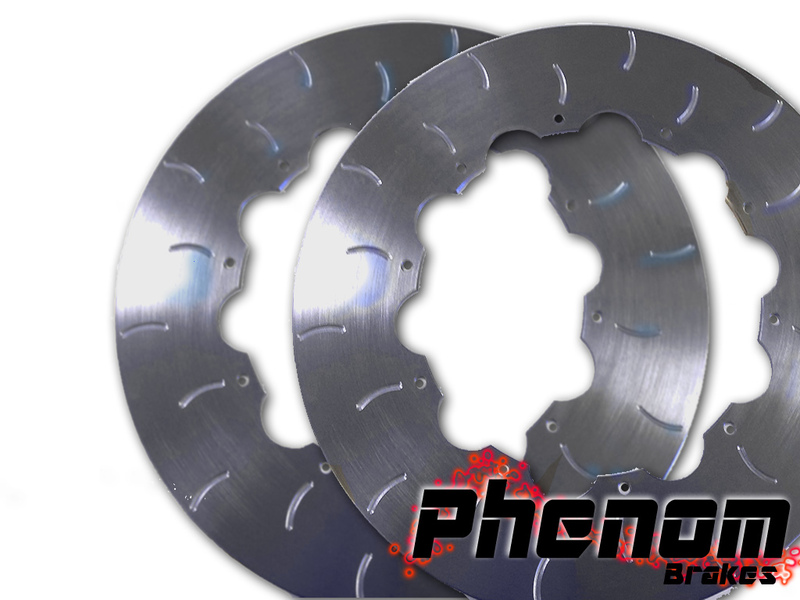 Phenom brake rotors offer racing rotor performance at a price that won't "brake" your budget. Made in the USA - they feature high quality materials with gas slotting and stress relief to elimnate cracking and early wear. These rotors are a direct replacement for your Stasis brake kit that use the 390mm x 32mm rotor with the 4 piston or 6 piston caliper. Compatible with street and race pads. They come stock with the slotting pictured - but can be ordered with straight slots (or no slots).